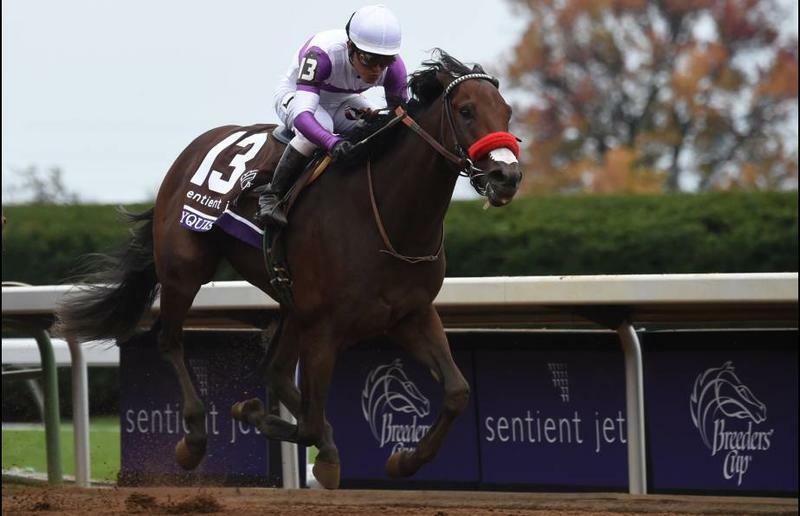 Reddam Racing LLC’s Sentient Jet Breeders’ Cup Juvenile (Grade I) winner Nyquist (#15) is the likely individual choice, but the ever-popular “All Others” (#24) wager is the morning line favorite for the first of four pools of the 2016 Kentucky Derby Future Wager (“KDFW”) that opens a four-day run on Thanksgiving Day at Churchill Downs Racetrack, TwinSpires.com and other online wagering outlets and satellite wagering centers across North America. Nyquist, who completed a perfect five-race 2-year-old campaign with his Breeders’ Cup win at Keeneland on Oct. 31, is listed as the 10-1 choice among 23 individual horses in the field of 24 wagering interests in KDFW Pool 1. But Churchill Downs odds maker Mike Battaglia has tabbed “All Others” – which includes all 2-year-old Thoroughbreds other than the 23 individuals on the Pool 1 roster – as a strong morning line favorite at odds of 7-5. The first pool of the 2016 Kentucky Derby Future Wager opens at noon (all times EST) on Thursday, Nov. 26 and betting will conclude on Sunday, Nov. 29 at 6 p.m. The wager, which was introduced in 1999, will enable racing fans to wager on candidates for the $2 million Kentucky Derby Presented by Yum! Brands (GI) well in advance of the race at odds that could be much more attractive than those available on the day of the race. The pool also includes Exacta wagering on the 24 wagering interests in the four-day pool. The opening pool of the 2016 Kentucky Derby Future Wager will be accompanied this year by the first Kentucky Derby Sire Future Wager, which allows Derby fans to wager on the sire that will produce the winner of the upcoming Run for the Roses. Like the Future Wager, the sire wager features 23 individual sires of horses in this year’s crop of Kentucky Derby-age Thoroughbreds, along with an “All Others” betting interest. The Kentucky Derby Sire Future Wager, like the KDFW, offers $2 Win and Exacta wagering. It will run concurrently with the opening KDFW Pool and both are schedule to close Sunday at 6 p.m. The wagering interests for each pool of the Kentucky Derby Future Wager is chosen by a Churchill Downs team that includes Racing Secretary Ben Huffman, Senior Director of Communications Darren Rogers, Pari-Mutuel Marketing Manager Gary Palmisano and Vice President, Racing Communications John Asher. The 2016 Kentucky Derby is scheduled for Saturday, May 7, 2016 – the latest possible date for the race run annually on the first Saturday in May. Last year’s Kentucky Derby, won by Zayat Stables’ eventual Triple Crown winner American Pharoah, attracted a record on-track crowd of 170,513 at Churchill Downs and additional 17.9 million watched the race on NBC. American Pharoah’s Kentucky Derby triumph resulted in a $7.80 return for a $2 win wager on the day of the race. The respective win payouts on a $2 KDFW win wager on American Pharoah were $27.60 (Pool 1), $23 (P2), $18.20 (P3) and $13 (P4). The winning Derby Day payout for a $2 exacta bet for the 1-2 finish by American Pharoah and runner-up Firing Line was $72. But the KDFW exacta payouts on the Derby’s 2015 final result returned $58 in Pool 1 as runner-up Firing Line was part of the “All Others” and not an individual betting choice, with returns in the remaining pools of $658.80 (Pool 2), $508 (P3) and $109.80 (P4). 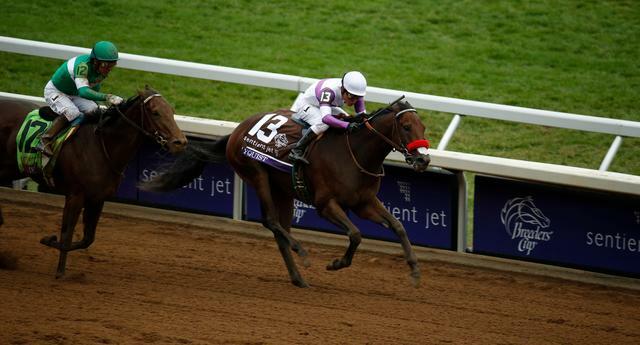 Individual KDFW Pool 1 favorite Nyquist counted four graded stakes triumphs among his five victories in 2015. Along with the Breeders’ Cup event, he won the FrontRunner (GI) at Santa Anita and Del Mar’s Del Mar Futurity (GI) and Best Pal (GII). He is trained by Doug O’Neill and was ridden in each of his races by Mario Gutierrez, both of whom had teamed with Reddam Racing to win the 2012 Kentucky Derby with I’ll Have Another. 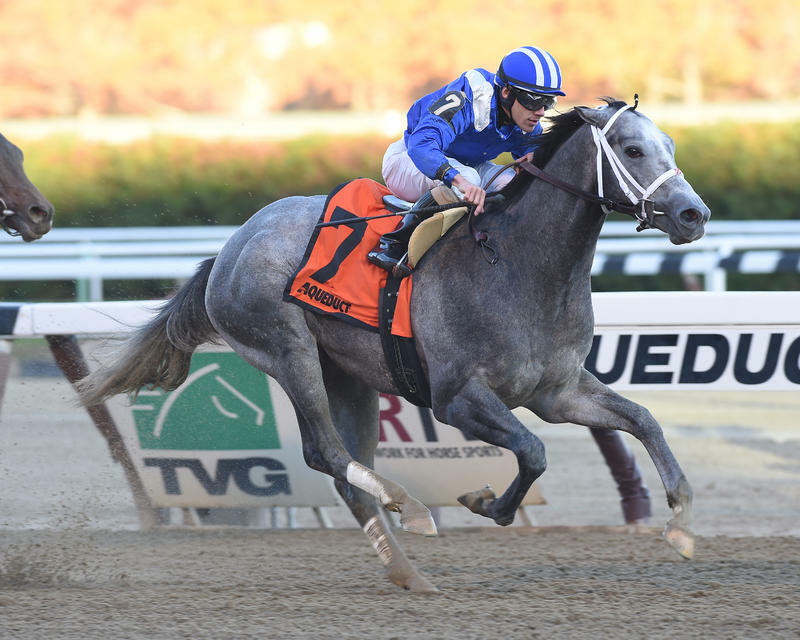 Other top early contenders for the 142nd running of the Kentucky Derby in KDFW Pool 1 include Albaugh Family Stable’s Brody’s Cause (#3, 15-1), winner of the Claiborne Breeders’ Futurity (GI) at Keeneland; Shadwell Stable’s Mohaymen (#13, 15-1), an unbeaten son of Tapit and winner of Aqueduct’s Nashua (GII) on Nov. 4; and Big Chief Racing LLC and James Justice’s Swipe (#20, 15-1), a winner only once in seven 2015 races but runner-up to Nyquist in all four of the latter’s stakes victories. Bob Baffert, whose triumph with American Pharoah in the 2015 Kentucky Derby raised his victory total in America’s greatest race to four, leads all trainers with three KDFW Pool 1 wagering interests. The Baffert trainees are Drefong (#6), Mor Spirit (#14) and Toews On Ice (#22). Trainers with two horses among the pool’s individual wagering interests are Chad Brown (#8 Flexibility, #9 Gift Box), Mark Casse (#1 Airoforce, #5 Conquest Big E), Keith Desormeaux (#7 Exaggerator, #20 Swipe), Kiaran McLaughlin (#2 Annual Report, #13 Mohaymen) and Dale Romans (#3 Brody’s Cause, #23 Unbridled Outlaw). No scratches or refunds of wagers are permitted in the Kentucky Derby Future Wager. If it is determined during a pool that a wagering interest will not be able to participate in the Kentucky Derby, wagering on that interest will be suspended immediately. Information on the Kentucky Derby is available online at the redesigned official event web site at www.KentuckyDerby.com/FutureWager. 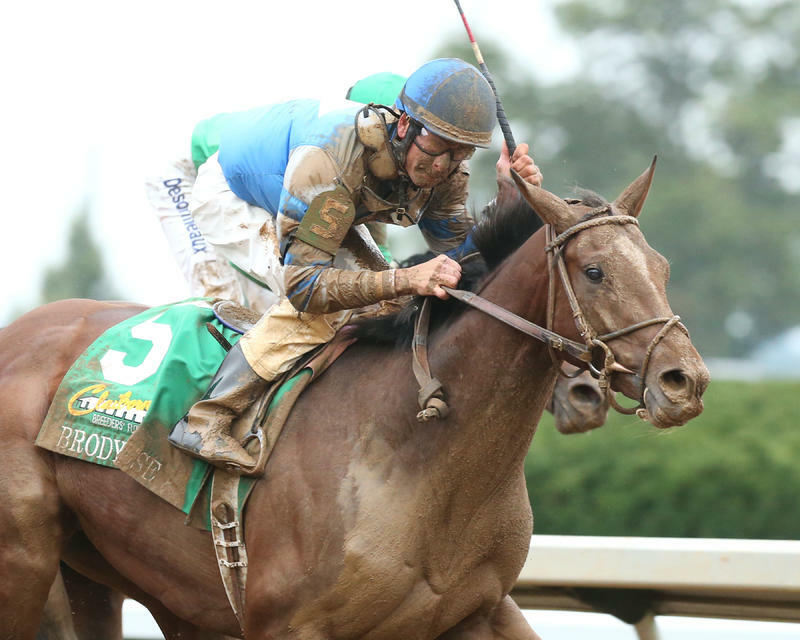 Real-time odds on the Kentucky Derby Future Wager, the Kentucky Oaks Future Wager and the Kentucky Derby Sire Future Wager will be presented on that site throughout each pool.